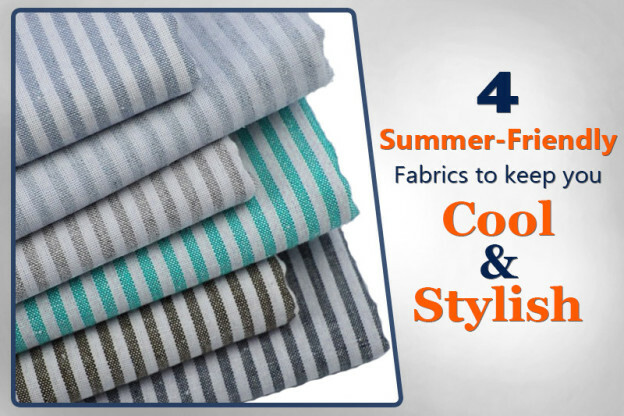 The best way to beat the summer heat is by choosing the best fabric for your clothes. They are our protective gear which protects us from all the harmful rays and sun. Thus, you must choose your clothes wisely, one wrong fabric can make your skin cause inflammation, soreness, irritation, rashes and redness. It is recommended that you must choose fabric which is breathable, absorbent and lightweight. Cotton: Affordable, strong, versatile, comfortable and flexible fabric – many people have clothes with this fabric already. Cotton is breathable and lightweight and suits all skin type. Linen: Linen is almost same like cotton – light weight and strong. It is woven precisely in a perfect manner where you won't feel irritate in any kind of temperature, thus helping you stay cool. The best part of this fabric is that you don't get any sweat stains on your apparel because linen's water retention capacity is high. The second best thing is that over time, drying and washing makes the cotton fabric weak and coarse, leading to tear and fray, but linen gets softer with time. Silk: This fabric is a luxury item because of its high price. But it's okay if you wear this occasionally because cotton won't be suitable for this. If you are planning to wear something which makes you look versatile and rich, then silk is your savior. It is very light weight to wear and does not make you feel hot and annoying. Light weight wool: This is not the winter wool which you wear in winters. It is basically the tropical wool which is woven less densely as compared to others. Many suits are either made in a woolen blend or woolen fabric. We all know that summer vacations are in school and colleges not in your workplace. Somehow, you need to bear this heat and go to your work. However, wearing this fabric won't hurt your summers and will also keep you versatile and elegant. This is a perfect substitute and does not wrinkle too. On That Note: Well we hope these selected fabrics will make your summer easier!